Congratulations to the latest group of puppies (and owners) who successfully completed the Kennel Club Puppy Foundation course. Archie, B-Dog, Chester, Lance, Woody, Muffin and in the foreground is Bunty, winner of the final week Challenge competition. 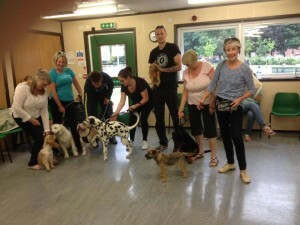 As always, another great group of dogs with a range of breeds, sizes and lovely personalities – great fun to teach. It is so important to make the most of this puppy stage for training, interaction and bonding with your pup. This is the best time to build a positive approach for the life-time relationship between owners and their dogs. Well done to this group for progressing so well! Really looking forward to seeing those who are going on to our Improvers class.